Get the most of your space with these small kitchen ideas. When you only have a limited amount of space in your kitchen, it can quickly become cramped and claustrophobic. But how do you open up your kitchen? The more space you save in your kitchen, the better you’ll feel about it, and you’ll also want to spend more time in your kitchen. With these clever small kitchen ideas, you can get the most out of your space. You’ll never get anything done if your kitchen is too cluttered. Inventory everything that you keep in your kitchen. If you don’t use a particular item on a regular basis, or just don’t need it anymore, get rid of it. One way to determine the value of a kitchen gadget is to box it up. Everything else should go in a box that you store elsewhere in your home. When these lesser-used items become necessary, get them out of the box and find a space for them in the kitchen. After a month or so, evaluate what remains in the experimental box. Can you part with these items? Try hanging up pots and pans on the walls instead of stacking them in the corner. Hooks and pot racks are good ideas to use for saving space this way. You could also consider adding a floating island or a wheeled cart that can increase your counter space. These are fantastic solutions for integrating an island into a small kitchen, which might not be able to accommodate a standard island. Whether you need a beautiful bathroom remodel, a kitchen remodel, or a home remodel, the experts at Kitchen and Bath Depot are here to help with all of your design and building needs. 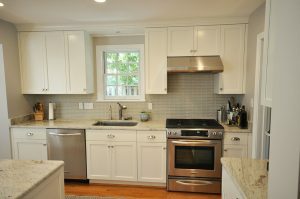 We provide remodeling services for our valued customers throughout the Maryland and Washington, D.C. area. If you are ready for a quote and to see how we are different than other companies, contact us online or give us a call at (301) 888-5324. For more tips, follow us on Facebook, Houzz, Twitter, Google+, and Pinterest. This entry was posted on Friday, August 18th, 2017 at 10:42 am. Both comments and pings are currently closed.